Gingrich once "Embraced" Yasser Arafat - leader of "Invented People"
Today while US presidential candidate Gingrich is making statements about the Palestinians being "Invented People," it was the same man who held hands of Yasser Arafat at the end of the Oslo Conference in September 1993 and offered advice about creating a state for the same group of people he now refers to as inauthentic. The photograph above shows how men could change for their personal gains. 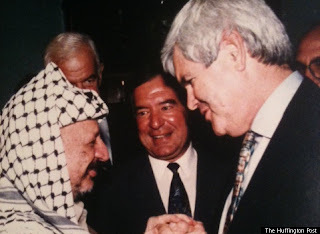 Today, Mr Gingrich needs Isreali support badly to sail through his presdidential campaign, and thus can belittle anyone opposed to Israel to gain sympathies. Read the full post and also the comments proffered by viewers at the end of the psot. One commenter very rightly says that even Americans are invented people as a few cntruies from hence thre were no Americans either.